There’s a lot to say about Venom before even watching the movie. A solo movie has been in the works for a while, and of course we got a version of the character in the god-awful Spider-Man 3 (not all of it was bad, but a good chunk of it), we know have a solo movie with a great lead in Tom Hardy. This version, of course, was caught in a storm of “is it or isn’t it connected to the Marvel Cinematic Universe?” Of course, the answer was a big ol’ nope, but apparently it is left open for the possibility of being connected – which is why the movie is PG-13 – well, at least one reason. There is also Hardy’s comments that the movie cut thirty to forty minutes, but he later backed off those comments, and the early reviews saying the movie isn’t good. Then the theory that A Star is Born lead Lady Gaga’s fans are saying negative things about Venom to help her movie get the better of the weekend – which is honestly dumb to even think, but whatever – so all of that said, where does Venom actually land? Well, for me, it’s a very, very mixed bag. Venom follows Eddie Brock (Tom Hardy), a journalist who has made a name for himself by exposing the dirty stories. His next assignment leads him to Life Foundation founder, Carlton Drake (Riz Ahmed), who is secretly running experiments on people with alien parasites called symbiotes. When Eddie pushes Drake with the tough questions, Eddie loses everything; his home, job and fiancée Anne Weying (Michelle Williams). Eventually, he gets the opportunity to expose Drake, with the help of Dr. Dora Skirth (Jenny Slate), and while he finds evidence of Drake’s nefarious ways, Eddie gets a symbiote called Venom (which he also voices) attached to him, and everything gets much worse. Like I mentioned, Venom is a very, very mixed bag. On paper, Venom was set up for success with the talented cast and a character that comic book fans love. Unfortunately, Venom drops the ball with pretty much everyone involved, and while the hate or dislike for Venom is very strong online, I can clearly say that Venom is not as bad as some would have you believe. Is it a great or good movie? No, not really, but Venom is somewhat entertaining when it decides to let loose. Of course, everyone joked about Hardy playing Eddie Brock/Venom because he has a career of voicing characters that are hard to understand or what-have-you. That said, Hardy does the role justice for what he’s given. There are some moments as Eddie that are borderline, but for the most part he’s rather controlled. It’s voicing Venom that may divide some fans as the relationship between the two is somewhat odd at first, but as the movie keeps going, it becomes pretty cool to see them play off each other, even though it is Hardy basically talking to himself. That being said, Venom also deals with a huge tonal problem, and some of it relates to the character of Venom himself. The movie tries to interject some humor in scenes – most of it doesn’t quite land – and when it comes to Venom, there are times were he’s a cold-blooded killer, and then starts cracking some humorous jokes. I’m not against adding some humor, but the execution of it doesn’t land at all. Going back to the cast, the supporting cast is pretty much wasted here. While it’s cool to see Riz Ahmed play a bad guy, Carlton Drake just wasn’t the villain role for him. The character comes off as a mustache twirling villain at times, and his transformation to the big bad in the last act is extremely underwhelming and rushed. Michelle Williams, Jenny Slate and Reid Scott as extremely underwritten with Williams’ Anne playing a glorified ex-flame, and while she has one standout scene, it’s not enough to make up for her nothing character. Speaking of nothing characters, Reid Scott plays Dr. Dan Lewis, Anne’s new boyfriend after breaking up with Eddie and doesn’t really serve any purpose other than being the other guy. Lastly, and unfortunately, Jenny Slate gets the worse end of it as she serves as an exposition character informing us and Eddie why Drake is using the symbiotes. Her character should have been more important, given that they give her a reason for doing what she does, but we don’t see it. When it comes to everything else, the special effects are just okay. Venom himself is arguably the best looking visual effect in the movie, but it’s not saying much when everything else either looks muddied or okay. The final fight between Venom and Riot is hard to watch, not because it’s bad or rushed, but because it’s hard to sometimes know who is who. The action is also not that bad, with an escape/chase sequence in the streets of San Francisco and a showdown with police being the standouts. Finally, the rating really shows. The movie is rather bloodless considering how certain characters die, and Venom biting people’s heads off on some occasions. I’m not that concerned with a movie’s rating most of the time, but it clearly shows here. All in all, Venom is a mix bag of everything, and missed opportunity to do something great, and start Sony’s Marvel Universe strong. There are some good things, some bad and some downright awful, but watching Tom Hardy do his thing could be enough for you to sit through the whole thing and not regret it. Regardless of that, it should be interesting how Sony moves forward with this. Welcome to another edition of Mini-Reviews. This time, it’s more of a mixed than it was last time. So let’s get to it, shall we? Cast: Brad Pitt, Marion Cotillard, Jared Harris, Daniel Betts, Lizzy Caplan, Matthew Goode and Simon McBurney. Synopsis: In 1942, an intelligence officer in North Africa encounters a female French Resistance fight on a deadly mission behind enemy lines. When they reunite in London, their relationship is tested by the pressure of war. Robert Zemeckis is back with a World War II drama that sees two great actors come together to give the genre a little twist. So it’s a little hard to fathom how Zemeckis was able make a bit of a water-downed film with great performances, but overall the structure of the film really hurts the film. 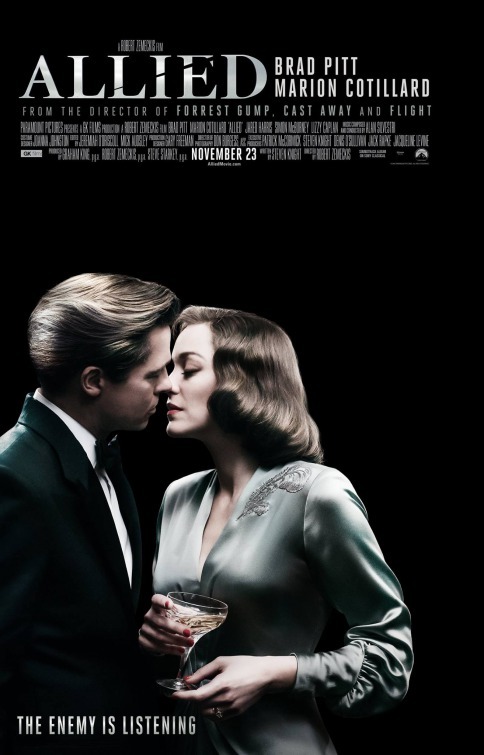 Allied follows spy Max Vatan (Pitt) who goes undercover in French Morocco in 1942 where he meets with French resistance fighter Marianne Beausejour (Cotillard) to pull off a mission to kill the German ambassador. The two eventually fall in love with each other and move to London where they get married and have a child. However, Max suddenly gets called in by British intelligence and is told that his wife could be a German spy. Not only that, if it is true, Max has to kill her himself. What follows is Max’s quest for answers to something he doesn’t believe. Allied works on some levels. Pitt and Cotillard are great together and hold their own when need be. However, the first half of the film is much better than the second half. Also, Cotillard has much more to do and is fleshed out a lot more in the first half than the second. Seeing her work her charm against high ranking German officials so they can get close to the ambassador they need to kill was fun to watch, but afterwards it becomes Max’s story on whether or not his wife is a spy and what is he willing to do to prove it’s not true. There’s nothing wrong with it becoming Max’s story, but when it does turn all its attention to him, Cotillard doesn’t really do anything until the final twenty minutes of the film. The film also loses some of its intensity after the first half of the film. Some of the big tension moments don’t have the sense of level of urgency or intense moment of fear or not knowing, so it doesn’t really help considering this is a spy drama thriller. There are great moments, I don’t want to take away anything from the film on that front, but overall the film lacked a certain push the film needed to push it over the top. All in all, Allied is a fine film with good performances, but the sudden change of perspective and it lack of focus and intensity like the first half hinders the film from being great. Synopsis: An uncle is forced to take care of his teenage nephew after the boy’s father dies. Manchester by the Sea’s synopsis sounds rather simple, add in the fact that it’s getting a limited release at first will add to people’s decision to maybe pass this up. However, the film has been making a ton of waves on the film festival circuit, and is already getting people predicting this is a huge front runner come Oscar season. Finally watching the film, I can see why. Manchester by the Sea is truly one of the best films of the year, and one that is very human when it comes to dealing with loss and grief. The film follows Lee Chandler (Affleck), a loner janitor/handyman in Boston who is a bit rude and doesn’t seem interested in anything going on around him. That changes a bit when he gets a phone call saying his brother Joe (coincidently played by Kyle Chandler) has passed away. Lee makes the journey back to the small town of Manchester to settle his brother’s affairs, which also includes dealing with Joe’s teenage son Patrick (Hedges), and Joe’s wish of Lee watching over him. What follows is Lee and Patrick’s story of the both of them dealing with the loss of Joe, and how the deal with their situation as well as Lee dealing with linger thoughts of his own traumatic event. Like I mentioned before, the synopsis sounds rather simple but there is a lot to unpack in the film, and all of it is worthwhile. The film doesn’t rely on usual character yelling at each other before reaching that peak moment of emotions that they forgive each other and are finally happy. The film feels real, and lets every character go through their own emotions like everyone does. Everyone grieves differently, and the film shows that in its way. The great thing is that we spend enough time with Lee and Patrick, and get to know them. Casey Affleck continues to show that he can handle great material and isn’t just Ben Affleck’s brother. Affleck as Lee is rather intriguing to watch. A good chunk of Lee’s backstory is told through flashbacks that not only make us understand a bit of where Lee is coming from, but is tremendous effective and dramatic. I’d be surprised if Affleck isn’t at least nominated for Best Actor come Oscar season. However, it’s Affleck’s rapport with young actor Lucas Hedges that carries the middle of the film. Hedges has done some projects like Wes Anderson’s Moonrise Kingdom, and even a small role in The Grand Budapest Hotel, but this really allowed him to break loose and show his range. Don’t be surprised if you start seeing Hedges in a lot more things soon. The rest of the cast fairs well too with Michelle Williams making the most of her small screen time with a powerful performance near the end of the film. 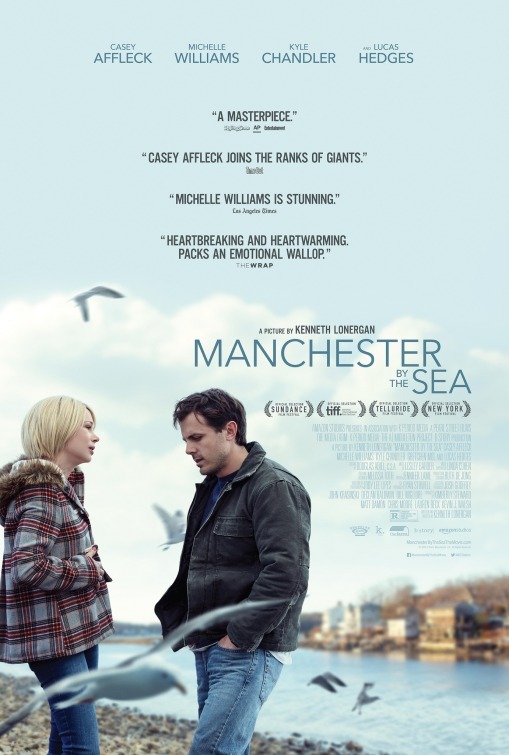 All in all, Manchester by the Sea is one of those films you should experience for yourself. It’s a very real emotional film that is lead by Casey Affleck in one of the best films of the year. All the buzz surrounding the film is completely worth it, and while at times the film may feel aimless, it’s done in a way that actually works.